Thai Vi Temple & Thai Vi Festival. 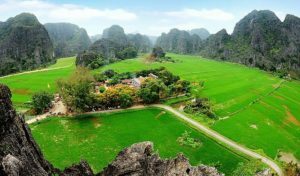 Located in Tam Coc – Bich Dong tourism site, Thai Vi Temple belongs to Van Lam village, Ninh Hai Commune, Hoa Lu District. 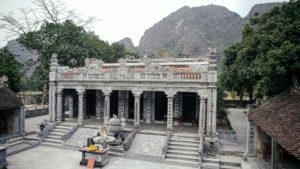 The temple is a place to worship Kings and generals of Tran dynasty is one of the most powerful and prosperous dynasties of feudalism in Vietnam. Lasting 175 years, Tran dynasty obtained remarkable achievements in various aspects of which the most outstanding is victory of three times defeating Nguyen – Mong invaders. To memorize the foundation of Vu Lam royal step – over place, after the King’s death, Van Lam villagers built Thai Vi temple on the base of ancient Thai Vi Hermitage and called it “Thai Vi Tu” the name of “Thai Vi” originated from the meaning that this was the place where King Tran left home to become a monk. The majestic and silent look of the temple is obtained by “noi cong ngoai quoc” architecture metheod with various stone works sophíticcatedly án meticulously made which already reach the level of an art. Thai Vi Temple Festival takes place from 14th to 16th day of March in lunar calendar at Van Lam Village, Ninh Hai Commune, Hoa Lu District. The festival is an occation for local people and the whole country to commemorate Kings tran – emperors with great contribution to the country and people. The Ritual consists of palanquin procession and ceremony. The Festival is marked with entertainment activities for local people and attendees with tradional games such: Dragon dance, Kylin dance, human chess, wrestling, boat sailing, etc.